To heed the King’s advice to the White Rabbit, I should begin at the beginning and go on till I come to the end, then stop. But I’m not so sure any appreciation of Lewis Carroll’s Alice in Wonderland books can be quite as straight-forward. Already confused? Perhaps, but it comes to something when a ‘book of nonsense’, as the author described Alice’s Adventures in Wonderland, is still so widely loved and revered 150 years after its publishing debut. And with that in mind, a number of events are being held and tie-ins published to mark that grand 2015 anniversary. 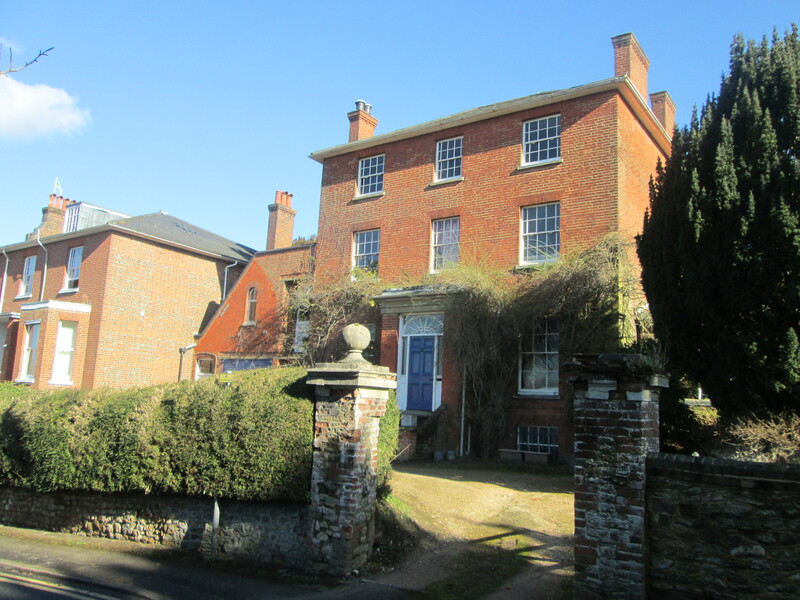 I carried out my most recent pilgrimage of sorts in February in my hometown, Guildford, which has its own strong links with the Cheshire-born, Oxford-based writer – real name Charles Lutwidge Dodgson – who first came to Surrey’s county town in the summer of 1868, looking for a home for his six sisters, subsequently leasing The Chestnuts – built seven years earlier – on Castle Hill overlooking the historic Keep. 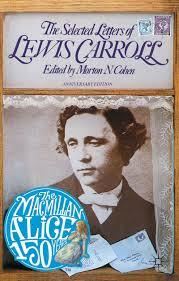 There he wrote his 1871 Wonderland sequel, Through the Looking-Glass and What Alice Found There. But let’s go back to fill in a few gaps first. By all accounts a natural storyteller, Carroll regularly invented tales to entertain friends, this mathematics lecturer at Christ Church, Oxford, a keen photographer and poet who chiefly wrote about algebra, geometry and logic. And if it were not for a summer river outing with the Liddell family in 1862, when Carroll was 30, those might have been his only published works. Instead, 10-year-old Alice Liddell – a daughter of his friend, the Dean of Christ Church – asked him to write down the story he told that day, and at Christmas 1864, he presented Alice with a handwritten copy bound in green leather, with other copies circulated to the author’s best friends, who persuaded him to seek out a publisher. Alice wasn’t the only one on that trip immortalised in book form, the author himself represented by the Dodo (Dodgson), the Reverend Robinson Duckworth as the Duck, and Alice’s sisters Lorina and Edith as the Lory and the Eaglet respectively. The initial Alice’s Adventures Under Ground – now part of the British Library collection – came in at 90 pages and included 37 illustrations by the author. The Mad Hatter’s Tea Party was added later, with many episodes expanded and the title changed. Carroll’s drawings portrayed Alice in a pre-Raphaelite/Dante Gabriel Rosetti style, with long, flowing hair and a serious expression. But by the time of that 1865 publication his words were accompanied by the black and white plate artwork of Sir John Tenniel, a Punch cartoonist who came to Carroll’s attention through illustrations for Aesop’s Fables. By 1911, Tenniel’s failing eyesight led to Macmillan being granted permission to ask Harry G. Theaker – who illustrated fellow Macmillan hit The Water Babies by Charles Kingsley – to take over, and he completed 16 new colour plates, iconic images we now know so well. 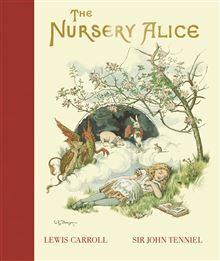 In fact, the commissioned artists that followed Tenniel’s lead as good as branded the look we now associate with Alice – not least that signature blue dress, blonde hair and Alice band, further enhancements in a similar style from John Macfarlane in 1927 and Diz Wallis in the 1990s continuing that legacy. 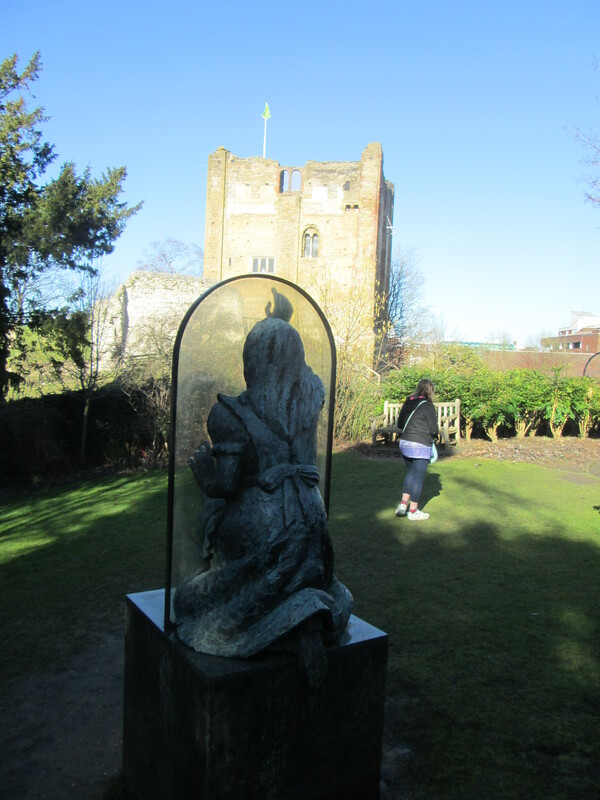 Talking of Wonderland-related art, there’s a striking bronze-cast sculpture depicting Alice looking through the looking glass in one of my favourite spots in Guildford, the Castle Grounds. And Jeanne Argent’s 1990 artwork is perfectly placed in a walled garden close to The Chestnuts’ sloping garden wall. 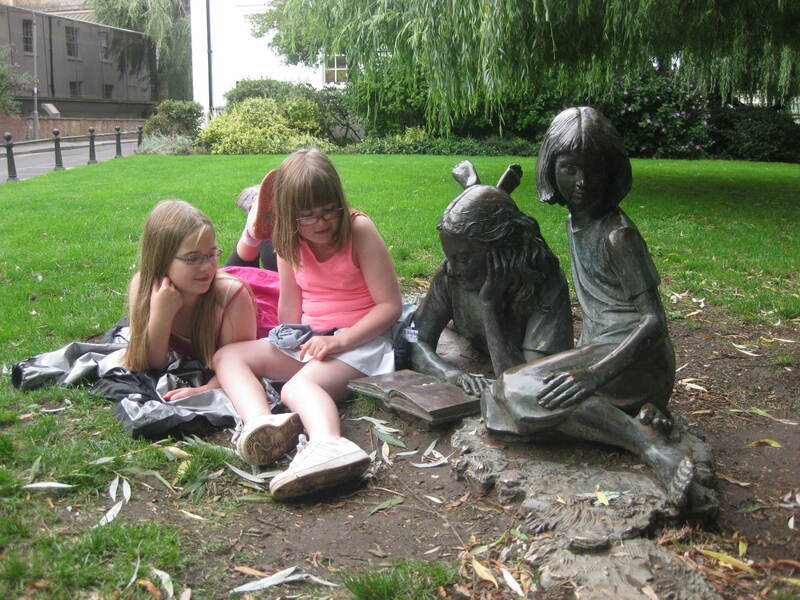 A short stroll away – on the banks of the River Wey at Millmead – is a second impressive bronze-cast sculpture marking Carroll’s Guildford legacy, Edwin Russell’s Alice and the White Rabbit, close to the Yvonne Arnaud Theatre, a rightly-popular feature for the town since 1984. Meanwhile, Guildford Museum – also a short walk from The Chestnuts – houses a collection of items from the Dodgson family, including an impressive papier-mache cow, a family letter, wooden toys and a biscuit tin decorated with images from the second book, made by a close associate of the author, one of just a few such items he sent out to friends. Carroll also lectured on maths at Abbot’s Hospital at the top of the town, and preached – in his role as an Anglican deacon – at St Mary’s, Guildford’s oldest church, again close to The Chestnuts. But on his last visit at Christmas, 1897, he caught influenza, dying of pneumonia on January 14th, 1898, shortly before his 66th birthday. You’ll find his grave in a quiet spot under a plain memorial cross at The Mount Cemetery above the town, facing towards the family home on the other side of the river, his aunt and several sisters buried nearby. And by the time of his passing, his Alice books had already been published in nine different editions – revised English versions as well as French, German and Italian translations. In fact, I should confess that the Alice stories didn’t make as big an impression on me as a child – at least not consciously – as the works of AA Milne, Elizabeth Beresford and Michael Bond. What’s more, a fair bit I’ve read about the author suggests I wouldn’t have much liked him, and we wouldn’t have seen eye to eye on several issues. Like the Alice stories themselves, there are implied darker undercurrents, albeit ones I see no point in going into here. I do however feel that 1865’s Alice’s Adventures in Wonderland and 1871’s Through the Looking-Glass and What Alice Found There deserve to be celebrated. And that’s exactly what initial publisher Macmillan and various other literary players are now doing. And having revisiting both books in recent times, I can genuinely say I’ve a new respect for Carroll’s historic texts. I pointed out in a recent feature on this blog how there’s something of a Marmite factor to the Alice stories, and fully understand if others have been put off by any of the many adaptations over the last century and a half – be it through poorly-illustrated books, ill-conceived plays, or lack-lustre or frankly-disturbing films. But there’s no denying Carroll’s imaginative approach – one that inspired many writers over the following generations. Much of the children’s lit I grew up with owed Carroll at least some debt of gratitude, and I feel I have a better understanding of what he set out to achieve now. I certainly love some of his wordplay, and the fact that you can find so many quotes out there from two relatively-short books tells its own story. Despite having plumped for a pretty shabby 1993 reprint – the first that came to hand, one with several mistakes and missing the illustrations Carroll alludes to at key points – I still found the storytelling shone through. I could question the premise that Alice is supposedly seven and a half by the time of Through The Looking-Glass, a factor late 20th century and early 21st-century kids may feel just doesn’t wash in the way she talks or the accompanying artwork. It’s also an early example of the ‘and then I woke up’ ending. But as that hadn’t been done to death at the time, I’ll let the author get away with that. And whatever quibbles I might have, the fact remains that without Alice there might not have been many of the following classic books I hold dear. So why didn’t I appreciate Alice more before? Well, to use a music comparison, one problem I’ve had in evaluating the books equates to that I had judging The Beatles’ landmark Sgt Pepper’s Lonely Hearts Club Band, from the year I was born, 1967. That was an album I was led to believe was their big moment, yet I could name at least half a dozen Fab Four albums I prefer. I didn’t really appreciate the innovations on that LP though. By the time I was able to listen with critical ears, top Beatles copyists like Jeff Lynne’s ELO were making better albums than Sgt. Pepper, with much of what made it so impressive first time around taken for granted. Similarly with Alice, it doesn’t come near several classic works more to my taste that followed in that supposed Golden Age of Children’s Literature up to the Great War. I preferred the storytelling of fellow Britons like JM Barrie, Rudyard Kipling, J Meade Falkner, Edith Nesbit and Robert Louis Stevenson. If you’re just comparing works of fantasy, Nesbit stands out again, and if I can go on to the 1920s, I’ll cite my all-time favourites from the Hundred Acre Wood. Yet I appreciate that we may not have got to enjoy Eeyore, Piglet, Pooh and Tigger or even Kenneth Grahame’s Toad if Carroll hadn’t tested the waters first. On that related subject, when I went back to Alice it struck me just how many of Carroll’s characters are now defined within our culture, be that down to the quality of the original text or the various film and cultural references that followed. And seeing as I made that late 1960s music analogy earlier, I’ll reference a few works from that period involving Wonderland imagery, either directly or indirectly. In her recent Looking Glass Girl reimagining of the stories, Cathy Cassidy – whose work sits fittingly next to Carroll’s on my children’s lit bookcases – mentions a few notable songs in a playlist for Alice, most relevantly three from 1967, Jefferson Airplane hit White Rabbit, The Velvet Underground’s All Tomorrow’s Parties (not quite so obvious, but it fits) and The Beatles’ Lucy in the Sky with Diamonds. I’ll add another John Lennon-penned single from that year, I Am the Walrus (inspired by the second book’s The Walrus and the Carpenter verse). In fact, that mid-to-late ‘60s period – staggeringly, a century after publication – seemed to inspire a wealth of Alice-related material that went on to impact on me. And it could be down to The Beatles and The Airplane alone that this scribe equates Carroll’s stories with the hallucinatory effects of psychedelic drugs. I’ll stick to that period and mention a few TV variations on the theme, not least two cult 1966 sci-fi series which dedicated episodes to Carroll’s Wonderland – Lost in Space’s Penny Robinson going through a looking glass to discover another universe in The Magic Mirror, and Star Trek’s Shore Leave seeing the crew of the Enterprise visit a planet of dangerous illusions and meeting a large white rabbit and Alice herself. Of course, a few film adaptations left more of a mark, with Disney’s 1951 animation Alice in Wonderland arguably paving the way. Who, for instance, thinks of the White Rabbit without contemplating him being late for an important date? Nearly 60 years later, a new generation were pulled in by Tim Burton’s Alice in Wonderland, Aussie-born Mia Wasikowska as a 19-year-old lead who has forgotten past visits to Underland, the land of her dreams, in a role opposite Johnny Depp’s Willy Wonka-like Mad Hatter. That star-studded cast included Burton’s then-missus Helena Bonham Carter – in a near-parody of Miranda Richardson’s Queenie in Blackadder II – and Anne Hathaway playing the Red and White Queens, Stephen Fry the Cheshire Cat, Alan Rickman the Caterpillar, Barbara Windsor the Dormouse, Paul Whitehouse the March Hare, and Michael Sheen the White Rabbit. Incidentally, I’ve since learned there’s a follow-up due next year, Alice Through the Looking Glass, with the same key actors. I also feel it’s worth mentioning 1972 film musical Alice’s Adventures in Wonderland, perhaps the most faithful to Carroll’s original, with a John Barry score and Fiona Fullerton a perfect Alice, getting across on screen a few of those growing-up issues, not just physically, but through general childish frustration at not having the ability to say the right things. There’s a fair bit of the humour and quirkiness of Carroll’s work incorporated too, a fine cast overcoming what we would see as the somewhat-dated look of the film and costumes, including Michael Crawford as the White Rabbit, Ralph Richardson as the Caterpillar, Roy Kinnear as the Cheshire Cat, Spike Milligan as the Gryphon, Peter Sellers as the March Hare, Dudley Moore as The Dormouse, and Dennis Price and Flora Robson as the King and Queen of Hearts. What’s more, it doesn’t go light on the ‘working on two levels’ angle, particularly when you picture Alice knocking back the intoxicating liquids, nibbling on magic mushrooms and trying a few colourful pills to help her reach the required size. Of course, as with all musicals (oddly enough) they tend to burst into song a bit too much for me, but it’s pretty much a commendable adaptation. If Fullerton’s Alice seemed more believable as Carroll’s lines sounded more feasible coming from a 15-year-old, Kate Beckinsale was a similarly good choice as a mid-20s mum reading to her child before becoming Alice Through the Looking Glass in a 1998 Channel 4 adaptation, also starring Penelope Wilton and Geoffrey Palmer as the White Queen and King, Sian Phillips as the Red Queen, and even Steve Coogan as Gnat. I guess it’s a testament to Carroll’s stories that Alice continues to lend herself to reinvention, and while skater girl Avril Lavigne sang the title song for Burton in 2010, Taylor Swift is just one of the latest artists to pen her own Alice tribute song, Wonderland. I’ll also namecheck Radiohead’s curiosity Pulk/Pull Revolving Doors from 2008’s Amnesiac, based on Alice’s ‘trying to find the right door’ dilemma, Tom Petty’s 1985 hit Don’t Come Around Here No More for its memorable promo video, Siouxsie and the Banshees for naming their label Wonderland and releasing their Through the Looking Glass LP in 1987, and Tom Waits for 2002 album Alice, written for a stage adaptation. I’ll add one last musical note, so to speak, with Blur frontman Damon Albarn’s wonder.land, a new version of Carroll’s tale coming soon, scripted by British playwright Moira Buffini. Following Albarn’s Dr Dee: An English Opera, it promises to be another fresh and original take on the genre, and opening at Manchester International Festival (June 29th – July 12th) then transfers to London’s National Theatre (opening on November 27th) before moving to Paris next year. It follows the story of unhappy 12-year-old girl, Aly, who is bullied at school but grows in confidence online, where she meets a cast of familiar characters. They start appearing in real life in subtle and unexpected ways, Albarn relating the idea of ‘falling down a rabbit hole’ into the digital age. While we’re getting arty, I’ll mention Salvador Dali’s 1969 Wonderland illustrations, Monty Python animator Terry Gilliam’s 1977 film romp Jabberwocky, and even the Wachiowski brothers’ The Matrix, from 1999, its Alice’s Adventures theme running throughout the trilogy. And on a more literary front, 60 years earlier James Joyce’s Finnegans Wake involved a Carroll-inspired dreamscape. Curiouser and curiouser, you could say. In fact, to paraphrase the Queen, sometimes I believe there have been as many as six adaptations before breakfast. As to the books themselves, there are definitely a few scenes unpalatable to this scribe, not least the nightmarish Pig and Pepper episode, also involving the fish and frog footmen, the Cheshire Cat, the Cook and the Duchess. Actually, it’s not a million miles from Peter Greenaway’s unsettling 1989 film The Cook, the Thief, His Wife and Her Lover. I can only really put it all down to a bad trip. 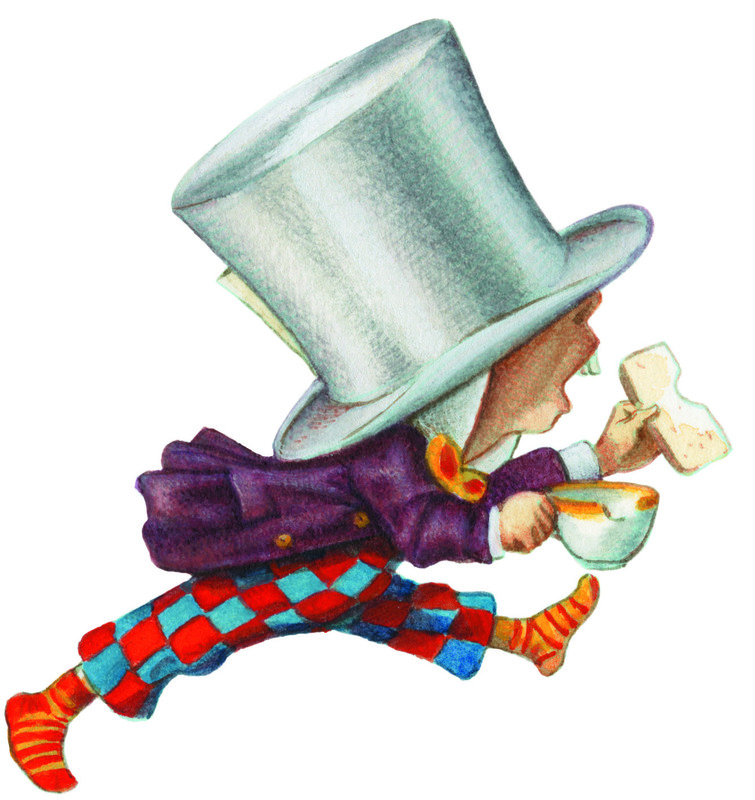 The quirkiness is at least more humorous if no less surreal at the Mad Hatter’s Tea Party, its comedy al fresco moves along the table and the butter-soaked watch that only tells the day of the month springing to mind. You certainly get the feeling this was stream of consciousness invention from the Dodgson lad. You never really know what’s coming next, let alone why a raven is like a writing desk. Our introduction to the Queen is even odder, as if Lewis’ medication had truly kicked in. Off his head, you could say. The RSPCA would have a field day among all those abused hedgehogs and flamingos, as would the NSPCC over that baby that became a pig. Unfit guardians for sure. I like the Mock Turtle and Gryphon scene for its wordplay and punnery, Carroll’s nonsense in full flow by the time of the trial finale. That said, you get the feeling Lewis had run out of time to reach his deadline, judging by the swift ending, Alice’s adventures more or less written off as a curious riverside dream. 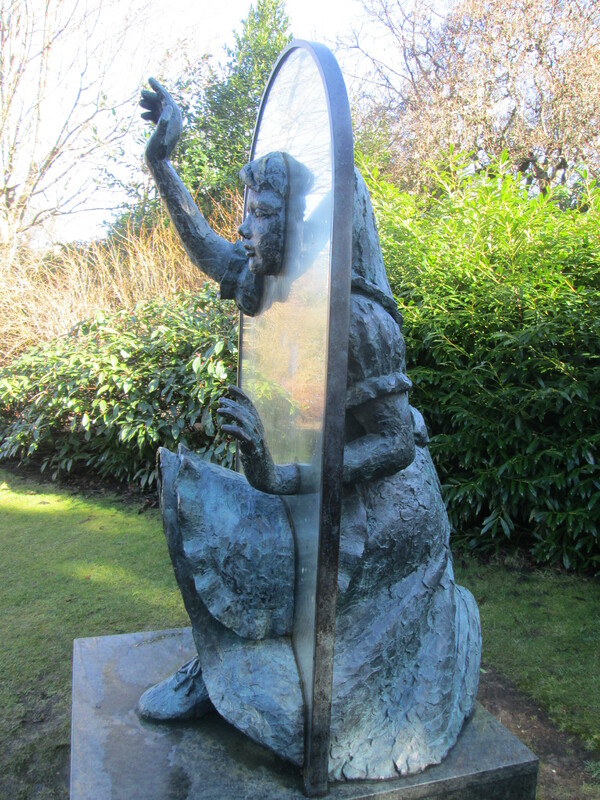 In fact, I’ll go as far to say I think I prefer Through the Looking-Glass in certain respects. Two of Carroll’s finest characters only turn up in that follow-up, Tweedledum and Tweedledee (not to be confused with Cheryl Tweedie) memorably portrayed by Matt Lucas in the Burton flick. Their tiresome battle games seem particularly well observed in the books, spanning the generations nicely. The legend of the Jabberwocky was likely a big influence on Roald Dahl’s BFG word creations a century later, and there’s a lot of verse in a book published the same year as Edward Lear’s The Owl and The Pussycat. The Walrus and The Carpenter inspired Donovan as much as it did fellow ‘60s experimental artist John Lennon. Talking of the tripping quality of the story, the Queen wrapping herself up in wool and becoming a sheep in a shop is a case in point. And Alice also gets to meet Humpty Dumpty, the Lion and the Unicorn, plus a Knight in crimson armour with questionable riding skills and a penchant for bizarre and useless inventions. As a rule, I prefer more realist texts from that Victorian era, but through falling down the rabbit hole and heading through the looking glass Carroll opened up a world of adventure and fantasy to us, and for that I feel we should be grateful. Incidentally, the author talks in an Easter greeting to readers for an 1876 edition of his ‘book of nonsense’ of ‘that delicious dreamy feeling when one first wakes on a summer morning’ and a ‘pleasure very near to sadness, bringing tears to one’s eyes like a beautiful picture or poem’. It’s his way of getting over how as a writer there’s no reason why he shouldn’t be ‘mixing together things grave and gay’. And that’s not a bad yardstick for any work of fiction. Today, 150 years after Dodgson’s day on the river with the Liddell sisters, the Alice stories remain a major part of the history of children’s literature this world over. What’s more, the original publishers can certainly feel proud of founder Alexander Macmillan’s initial belief in Carroll’s work and the illustrations that helped define these stories, helping create a publishing phenomenon that has been ‘sending readers to Wonderland since 1865’. 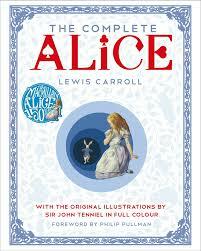 The Complete Alice: a new hardback gift edition (out in early July 2015), comprising the original books alongside archive material, with a new foreword by Philip Pullman, Tenniel’s illustrations coloured by Theaker and Wallis, a previously-deleted episode from the second book, Carroll’s poems and prefaces from four historic Victorian editions, and a new account of Alice‘s creation and first publication. Then there’s The Little Folks Edition, a new small hardback format edition of 1907’s shorter version of the original tales; The Nursery Alice, a new edition of the very first colour Alice’s Adventures in Wonderland, adapted by Carroll and Tenniel for younger readers for publication in 1890; and collectible Macmillan Classics editions of Alice’s Adventures in Wonderland and Through the Looking-Glass with colour plates, alongside new attractive paperbacks with black and white illustrations. For younger readers, there’s a range of titles too, not least a new picture book, Alice in Wonderland: Down the Rabbit Hole, complete with an audio version read by Joanne Froggatt, while Macmillan’s baby and toddler imprint Campbell celebrates the anniversary in its Busy series, with plenty of tabs to bring Wonderland to life. 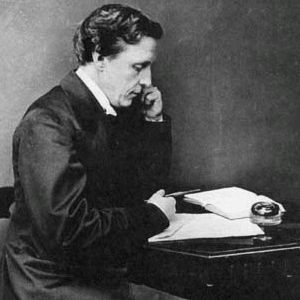 For those seeking out more information about Charles L. Dodgson, his life as Lewis Carroll and his work, there’s a new paperback must-have for the Alice enthusiast, The Selected Letters of Lewis Carroll: Anniversary Edition, while Morton N. Cohen’s definitive biography of the author is out in hardback, and – celebrating the language and fun in the Alice books – September sees the publication of What Would Alice Do? Alice’s Guide to Life, featuring some of the most inspired and humorous quotes from Carroll’s work. Meanwhile, Alice Day is on Saturday, July 4th, with activity packs available for libraries, schools and bookshops, in a year in which you can expect an Alice presence at various major literature festivals, a BBC TV documentary presented by Radio 4’s Martha Kearney, and various partnership events (some still being finalised at time of going to press), as well as exclusive commercial tie-ins such as Sophie Allport’s limited edition Alice in Wonderland collection and the OXO Tower Afternoon tea service. What’s more, there’s plenty of social media and web happenings to be found via the impressive www.aliceinweonderland150.com website and a special Facebook page. 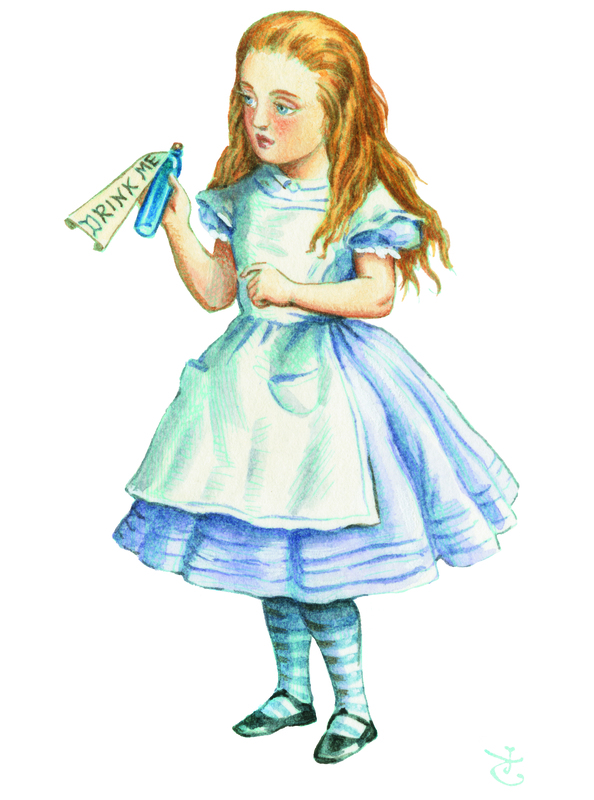 * Guildford Museum hosts a free Looking in Wonderland exhibition from November 28th, 2015, to January 23rd, 2016, with a selection of the best of Sir John Tenniel’s illustrations to Lewis Carroll’s Alice books on show. For more details, contact details and information about other exhibitions at the Castle Arch centre, head here. * To book tickets for Damon Albarn and Moira Buffini’s wonder.land musical, head to the Manchester International Festival website or London’s National Theatre site. * The Story Museum in Oxford, the town where the first story was created, Seven Stories in Newcastle-upon-Tyne may also be organising Wonderland-related activities this year, and are well worth checking out, while The Reading Agency and World Book Day may also be involved. 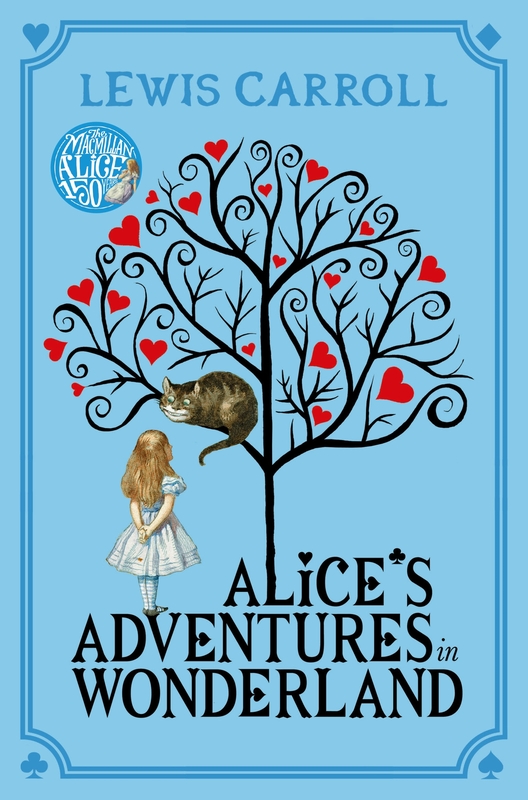 * There’s also a comprehensive list of more Alice-themed events around the world to mark the 150th anniversary at the lewiscarrollresources.net website. *With thanks to Alyx Price and Charlotte Copping at Macmillan for extra background material and official illustrations. This entry was posted in Books Films, TV & Radio, Music and tagged Alice in Wonderland, Alice Liddell, Alice's Adventures in Wonderland, Charles Dodgson, Edwin Russell, Fiona Fullerton, guildford, Jeanne Argent, Lewis Carroll, Lost in Space. The Beatles, Macmillan, Mia Wasikowska, Star Trek, Surrey, Through the Looking Glass, Tim Burton. Bookmark the permalink.